In the past decade, car travel in the United States has fallen to unprecedented lows. Predictably, that trend coincided with the rise of fuel costs. Slowly, Americans have adjusted their driving habits, taking fewer trips, driving more efficient vehicles, and choosing to live closer to their jobs. This is particularly true among millennials-those born from the early 1980s to the early 2000s-a group that drives 25% less than their counterparts 20 years ago. Despite these trends, gas prices have fallen again, and many are taking to the road in search of something beyond the familiar. If you have kids, though, they’re going to need to be kept busy during the journey. It’s easier than you think, and it won’t require a touchscreen or earbuds. Collect the screens and phones and tell them they may check their phones at pit stops or when you get to your nightly lodging. At the very least, set a time limit and collect them when the alarm sounds. Why? Because there is fun to be had! But even more than that, this is your chance to learn more about your child, to challenge and explore how he or she thinks. Take this opportunity to share some laughs and perhaps a thoughtful moment or two. 1. 8 paper dolls – Perfect for little kids, paper dolls have the added advantage of creating an activity you can do together prior to your trip. Make up with your children the paper dolls, put them in a shoe box and then pull them out once you’re on the road. 2. Activity wallet – Keep things fresh while reusing an old wallet! The activity wallet, which you fill with small activities, is sure to give to your kids plenty of fun travel time. 3. Matchbox Cars – It doesn’t take long to understand why matchbox cars are great on car trips – they are compact, and their wheels make any surface a road. Prior to your trip, have your kids design a road pattern on poster paper that they can use in the backseat! 4. Plastic bottle find-it game – Awesome for special needs children, this activity will keep your kids engaged while limiting overstimulation. 5. Lego candy tin – Bringing Legos on a trip could mean you’ll be finding wayward pieces in your car seats from years to come. But, using this handing travel container, you kids can play with Legos just about anywhere. 6. Magnet tin – Take a magnet sheet, cut it into a variety of shapes and sizes, and pack them all in a metal tin. They can use the tin to arrange the magnets, and clean up is a snap. 7. Popsicle Puzzles – Allows you to bring the fun of puzzles without all of the mess! Once you’re done with the popsicle, keep the sticks, draw a picture on them together, and then pull them apart. Voila, you have portable puzzles. 8. Abacus – The ancient counting tool isn’t just for stodgy math problems – in fact, the abacus is perfect for demonstrating to children how math actually affects their lives. They’re built for travel, too! 9. Lego matching game – So easy, you’ll kick yourself for not thinking of it early, the Lego matching game is imaginative, self-contained, and easy to pack. 10. Paper football – Perhaps you remember this game from your own childhood? Played on a simple flat surface (a piece of cardboard works great), and needing just a piece a paper and, maybe, some tape to play, paper football is great for your little sports fans. And just in case you can’t remember how to make a paper football. 11. 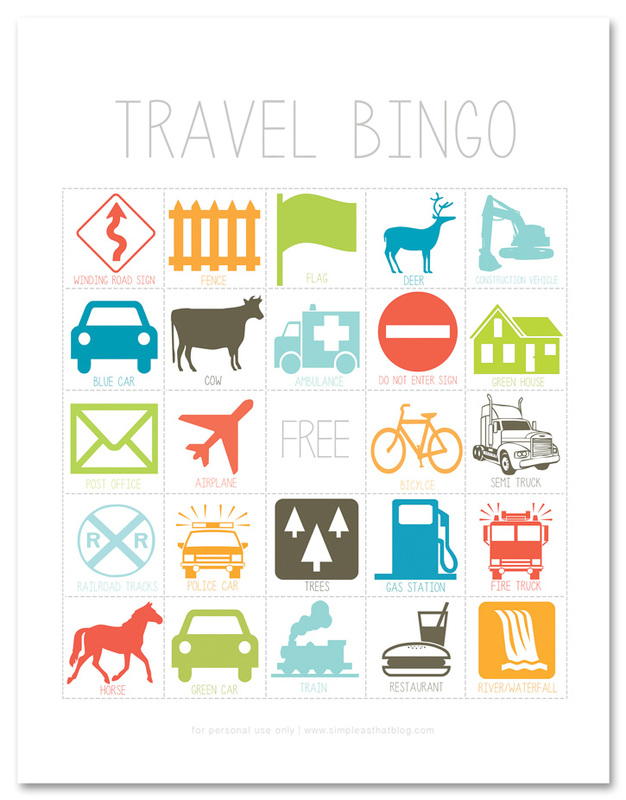 Travel bingo – Bingo is a great way to test your kids’ knowledge of numbers, while winning the game could entitle the winner to a special treat at the next gas stop, keeping them engaged and entertained. 12. Highway Quest game – If you’re kids are going to look out the window, they might as well do it with purpose. With so much to see, your kids will use their eagle eyes to spot the most items. 13. License plate game – The license plate game has always been a great way to talk about and understand geography, as well as familiarize your children with the many regions of your country. 14. Battleship – No need to pack cumbersome board game pieces on your trip. This printable copy of battleship means your children can play this game with a pen. 15. Waiting activities – If you forget to bring any games, these ‘waiting’ games can used in a pinch. 16. Teen games – Sometimes on long trips, teens can be a tough nut to crack. Once they are bored with their phones, though, pull out these teen games and watch them turn from screen addicts to engaged, creative people. 17. Classic conversation games – With all that travel time, why not take the opportunity to learn more about your children? These conversation games will help you delve deeply into your child’s dreams and goals without him or her even knowing it! 18. More group games – If you have a full load in your car, these group-oriented games will help everybody feel like the miles are flying by. 19. The Money Game – If keeping your kids from fighting on a long trip has been a problem in the past, this game may change their attitudes very quickly. 20. Retro Arcade Machine Gaming System – If you must use electronics, buying a retro game machine may do the trick. Pass it out, allowing each traveler to play for 10 minutes before passing it the next person.